As one bishop and professor of philosophy has put it, "In the final analysis, the question of salvation is always an inquiry into the balancing of human free will with God's mercy and forgiveness." The Bible itself has, as referred to before, a variety of verses on the subject that appear to be contradictory if not given additional reader interpretation. Influential theologians Emil Brunner and J.A.T. Robinson argue that these verses can be put into two distinct categories: damnation for some or eventual reconciliation for all. The mixed message about the afterlife described in the Bible has been commented on by scholars as early as 1917; then, Harvey W. Scott wrote, "That there is no definite affirmation, in the Old Testament of the doctrine of a future life, or personal immortality, is the general consensus of Biblical scholarship." Some sections of the Old Testament appear to argue that no afterlife exists even for the good and just, with the Book of Ecclesiastes telling the faithful: "The dead know nothing. They have no reward and even the memory of them are lost" (although this is not the normative Jewish view). The traditional view held by Christian organized religion comes from a variety of Biblical citations. It is stated in John 3:36 (NIV), "Whoever believes in the Son has eternal life, but whoever rejects the Son will not see life, for God’s wrath remains on them." Also, 2 Thessalonians 1:8-9 (NIV) declares, "Those who do not know God and do not obey the gospel of our Lord Jesus, they will be punished with everlasting destruction and shut out from the presence of the Lord and from the glory of his might." However, liberal and progressive Christians have often argued that the teachings of the historical Jesus did not mention exclusive salvation for a select few and have altogether rejected many sections of the Bible written by figures decades after the life of Jesus as man-made inventions that are to be taken with a grain of salt. In the first 600 years of Christian history, researchers have identified six main theological schools concerning apokatastasis. Four of them were Universalists, one taught "conditional immortality" and the last taught Eternal hell. Many early church fathers have been quoted as either embracing or hoping for the ultimate reconciliation of God with His creation. Those that did not embrace the teaching, such as Augustine, acknowledged that it was a common enough belief among Christians of the day. The concept of a final restoration of all souls particularly had large appeal in the East during the fourth and fifth centuries. In 2008, the Russian Orthodox scholar-bishop Hilarion Alfeyev of Volokolamsk, in his presentation at the First World Apostolic Congress of Divine Mercy (held in Rome in 2008), argued that God's mercy is so great that He does not condemn sinners to everlasting punishment. The Orthodox understanding of hell, said Bishop Hilarion, corresponds roughly to the Roman Catholic notion of purgatory. American Orthodox theologian David Bentley Hart has also argued for the coherence of the universalist position. ^ Otis Ainsworth Skinner (1807–1861), A Series of Sermons in Defence of the Doctrine of Universal Salvation, Page 209, "Repentance is a means by which all men are brought into the enjoyment of religion, and we do not expect any man will be saved while he continues in sin. The reason why we hold to universal salvation, is, we expect all men will repent." ^ a b c d e f g h i j k l m n o p q r s t Richard Bauckham, "Universalism: a historical survey", Themelios 4.2 (September 1978): 47–54. ^ a b Fisher, David A. (December 2011). "The Question of Universal Salvation: Will All Be Saved?" (PDF). The Maronite Voice, Volume VII, Issue No. XI. Archived from the original (PDF) on 2015-06-18. Retrieved July 2, 2014. ^ Scott, Harvey W (1917). "Future Life and the Book of Job". Religion, Theology and Morals. Riverside Press. p. 307. ^ 1 For details see L. E. Froom, The Conditionalist Faith of Our Fathers (Washington, DC: Review and Herald, 1965–1966). ^ Hosea Ballou, The ancient history of universalism: from the time of the apostles, 1842, p. 166. ^ Von Balthasar, Hans Urs & Greer, Rowan A. Origen. Pg 3. Paulist Press (1979). ISBN 0-8091-2198-0. ^ 1914 "Three Chapters". Catholic Encyclopedia. New Advent. Retrieved 2007-09-04. ^ "Origen and Origenism". Catholic Encyclopedia. New Advent. Retrieved 2007-09-04. ^ ed. John Anthony McGuckin, p. 61. See also Elisabeth Dively Lauro in the article on Universalism. ^ Christian Universalist.org, The Christian Universalist Association History of Universalism. ^ Seymour, Charles. A Theodicy of Hell. p. 25. Springer (2000). ISBN 0-7923-6364-7. ^ Matthew Hale Smith, Universalism not of God: an examination of the system of Universalism, 1847, p. 58, "Universalists claim Origen, Clement of Alexandria, and some others among the early fathers. Yet these fathers held not one doctrine peculiar to Universalism; neither did they believe in the salvation of all men." 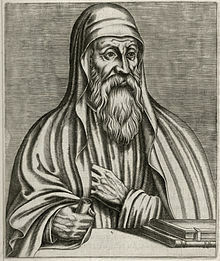 ^ Andrew C. Itter, Esoteric teaching in the Stromateis of Clement of Alexandria, 2009, p. 200, "Clement uses the term apokatastasis and its cognates generally to refer to the gnostic elect rather than to an eschatological restoration of the universe, or to a restoration of the faithful as a whole." ^ Schmithals, Walter. The Theology of the First Christians. Pp. 85–88. Westminster John Knox Press (1998). ISBN 0-664-25615-5. ^ Ludlow, Morwenna. Universal Salvation: eschatology in the thought of Gregory of Nyssa and Karl Rahner. Pp. 1–2. Oxford University Press (2000). ISBN 0-19-827022-4. ^ Hilarion Alfeyev, The mystery of faith: "Salvation will not be compulsory for anyone: it is 'those who wish to follow' Christ who will be saved. 63 The doctrine of universal salvation is expressed in a very definite and striking manner by Isaac the Syrian,"
^ See also Stetson, Eric. Christian Universalism: God's Good News for All People. p. 120. Mobile, Alabama: Sparkling Bay Books, 2008. ISBN 0-9670631-8-3. ^ Morwenna Ludlow, The Journal of Ecclesiastical History (2004), Cambridge University Press – "Why Was Hans Denck Thought to Be a Universalist?" ^ "Peter Bohler, one of the Moravian brethren, in order to make out universal redemption, lately frankly confessed in a letter that all the damned souls would hereafter be brought out of hell. I cannot think Mr. Wesley is thus minded. And yet unless this can be proved, universal redemption, taken in a literal sense, falls entirely to the ground. For how can all be universally redeemed, if all are not finally saved?" from Amirault G. Peter Bohler 1712–1775. ^ Amirault, Gary. William Law 1686-1761. Law W. Affectionate and Earnest Address to the Clergy. Address 191: "every number of destroyed sinners, whether thrown by Noah's flood, or Sodom's brimstone, into the terrible furnace of a life, insensible of anything but new forms of raging misery till judgment's day, must through the all -working, all- redeeming love of God, which never ceases, come at last to know that they had lost, and have found again such a God of love as this". ^ Seymour, Charles. A Theodicy of Hell. Pp. 30–31. Springer (2000). ISBN 0-7923-6364-7. ^ Thomas Brown, A History of the Origin and Progress of the Doctrine of Universal Salvation. ^ Catherine L. Albanese, A republic of mind and spirit: a cultural history of American metaphysical. ^ "'Inclusionism' deemed heresy". The Washington Times. 2004-04-21. Retrieved 2007-05-27. ^ Bill Sherman, "After last sermon, no regrets", Tulsa World, September 21, 2008. ^ "Founding Board Meeting of the CUA". The Christian Universalist Association. May 17, 2007. Retrieved 2008-11-22.